Dizgraceland: Funship Freddy: Friend or Fiend? 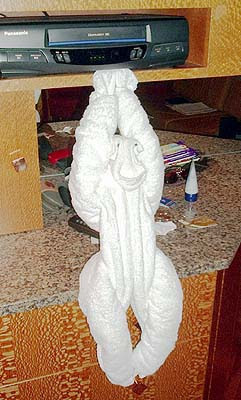 Okay, it's bad enough to toss back a few cocktails on a cruise ship and go back to your cabin to discover freakish towel animals hanging from the cabinets (especially in a dimly lit cabin). 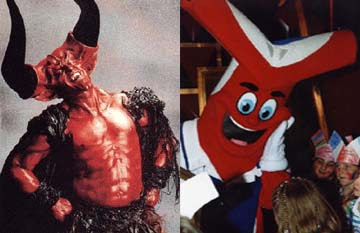 But some genius at Carnival Cruise lines has created a demonic mascot for the ships called Funship Freddy. And you can't walk past the onboard giftshop without seeing dozens of the hideous little things watching you. I think you catch my drift? EEEKKKSSS Funship Freddy is pretty scary if you ask me. What is even scarier is how much that person was paid to come up with that stupid thing. Whew! I'm glad you could see it too. I was beginning to think I was the only one who could see through Funship Freddy. You are so sick and twisted Tim. Frankly, I Find Funship Freddy Fabulously Freaking Friendly (emphasis on "freak"). Besides, don't you think Satan has gotten a bad rap the last 6,000 years. Let's cut the guy a break already. Nice alliteration BTW. But did I say anything about Satan? All I'm saying is that Funship Freddy is like satan. That would be a simile. Though if we look at the word saTAN, we see the word TAN clearly. 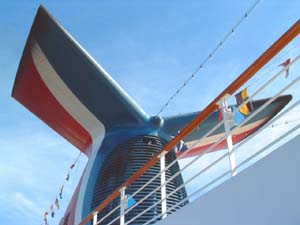 You get TAN on Carnival cruise ships or you burn. Both are things our friend SaTAN approves of. Satan has a tan. I agree with you here. He also is in excellent physical shape. Always sport'n a six pack. So we know he works out as well as tans. But... did you notice that he also goes in for the waxing. I have never seen a hair on the guy. Do you suppose that's why they call him Lose-the-fur? Plenty of time for towel animals, no time for lightbulbs. And so it goes. Puns like that will assure you a place next to our hairless yet tanned Satan in hell. Lightbulbs in the Wake, so what you are saying is, "So many towels, so little lightbulbs" ? Take it from one who has stood toe to toe with the devil...I would have jumped ship at first sight of this thing. Mickey, my friend. If I ran from the devil every time I've seen him, I would never stand still. But welcome back from the desert. Had I spied one of these creatures on MY bed, my first inclination would have been to pull out a gun and kill it! So, maybe it's a good thing they probably had metal detectors on the gang plank. After years of cruising, I have become immune to the towel creatures. When in Rome...besides, they do frown on slipping the Berretta on board. But if I'd had it,you can bet I would have gotten that lightbulb I was denied. Hey! I think that Funship Freddy is cool! I love him! ` He haunts my nightmares. Also, congrats, I think I shall cite this post on my one blog because it's that good. ` You know, to ease the trauma. I even saw him rapping once and it was just wrong.